This Malaysian busker was about to call it day, as not many people gathered around to hear him sing. Just as he started to sing for fun, the cutest little audience showed up… A group of four 3 month old kittens came to show their support! Music seems a more fundamentally human art form than most. It's home to our most intimate emotions and has such a strong effect on our brain chemistry that it's addictive. But it isn't just humans that love music. The science of music's effect on animals and even plants reveals something startling: It's not just an art form — it's essentially a force of nature. Due in no small part to the frustration of being woken up by an early-rising bird, most of us write off all animal noise as merely irritating. Animals, on the other hand, are empathetic when they listen to cross-species music, and react with emotions and behavior eerily similar to our own. At dog kennels, researchers found that classical music reduced anxiety in the dogs, helping them sleep more and bark less. 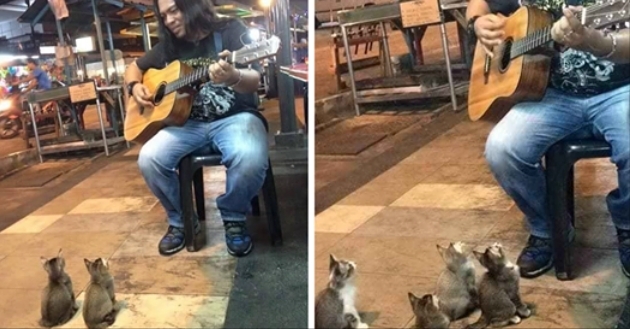 Responses to "Music-Loving Kitties Come To Listen To Street Singer Everyone Else Ignored"
Great interaction from both artist and the kitties! Most of us don't do this and that is a shame because animals have so much to teach us, if only we took the time. This is the best post i saw today. I'm amazed but not really surprised. I'm sure that is what this singer/guitar player needed at exactly this time. Look at his smile. it is so wonderful to see this.